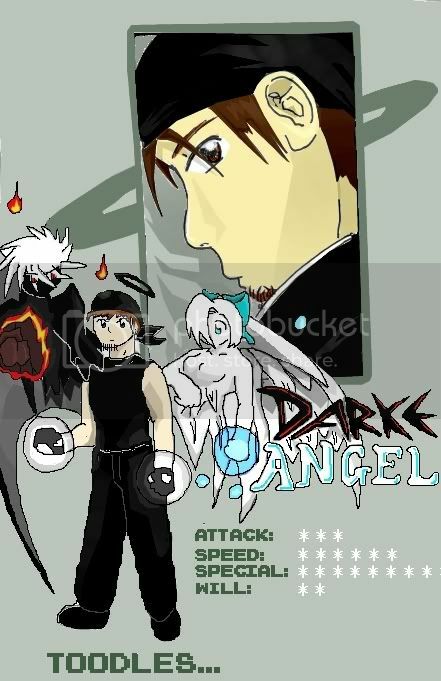 YOU HAVE SELECTED DARKE ANGEL! I have a dead body. I keep it in the fridge. friends added on a case by case basis. just adding me as a friend will not necessarily mean i'll return the favour. GB signings and PMs will be replied, provided they're friendly. no flames, spams, total noob-ular commets or general idiocy on this site, or the Corps will pay you a visit. furthermore, remember: its only illegal if you get caught. MyO forever! VIVA LA RESISTANCE! i havent posted since like...march. before easter at any rate. my bad. i guess i just lost interest...its been waning over the past year or two anyway, and i just gave up. my apologies for anyone who is/was watching me. i've made new friends, caught up with old ones and seen amazing things. and now i am back home, back to the old grindstone for the winter. not a lot has been happening really with me. the biggest event of the past month or so is that i cleaned my room. yup. i cleaned my room. properly. i can now see my carpet again! w00t! i also found some things i forgotten i had. its good to do a deep clean once in a while. Im getting closer to being ready for this years Camp season. i spent a good solid hour or so yelling abuse at the american embassy visa application website. the application itself is annoying enough, but having to do it on the website is worse! hopefully its all sorted now. i gotta send off for that real soon. i've also just finished watching a series called Sora No Woto. its a very beautiful 12 episode anime from the same animators who did K-ON. its set in europe in the future, but has the feel of an old fashioned era...sorta early 20th century europe. its hard to explain, but its quite light-hearted, has cute girls in it, and music plays a big part of the storyline. it is also quite capable of being dark and the story was very well written on top of the beautiful animation. i'd recommend it if you can see it. i've also recently got into Victory Gundam, one of the older Gundam series. its pretty dark, and the animation is old style, quite close to the animation in G Gundam. its pretty good though, and i am enjoying it alot. I also bought a V Gundam model the other week, which im finding much enjoyment in. so, other then that, not much is happening with me. its my mums birthday on monday, then easter next sunday! w00t. and i also have a party that im going to the following week. so im staying pretty active all in all. its been a fairly busy two months all in all. i still havent found a new job, but i've pretty much given up on that. Cotswolds (who im technically currently employed by) said they have more hours available this March so imm gonna stick with them for the time being. I went to see Ponyo at the cinema. It was a very enjoyable movie, perhaps not one of Miyazaki's best productions, but a veritable classic in its own right. I thoroughly enjoyed it and woulf recommend it to anyone. It's really nice to see a traditionally animated movie in the theatres today. It doesnt happen very often. I have also decided, after watching a whole spate of Miyazaki movies, that if i ever have kids, im gonna make them watch movies like Ponyo, Totoro, Howls Moving Castle, Kiki's Delivery Service, Porco Rosso etc when they're young. im gonna bring them up on a diet of Miyazaki movies. and a few disney movies too, maybe. there's just something so heart-warming and fantastic about a good Ghibli movie that invokes the imagination that you don't get in some of today's kids movies. your grip just a bit too much..